Powerful, yet easy to use, ScanForce bar coding solutions for inventory management and process automation can help you optimize your warehouse activities while increasing accuracy. 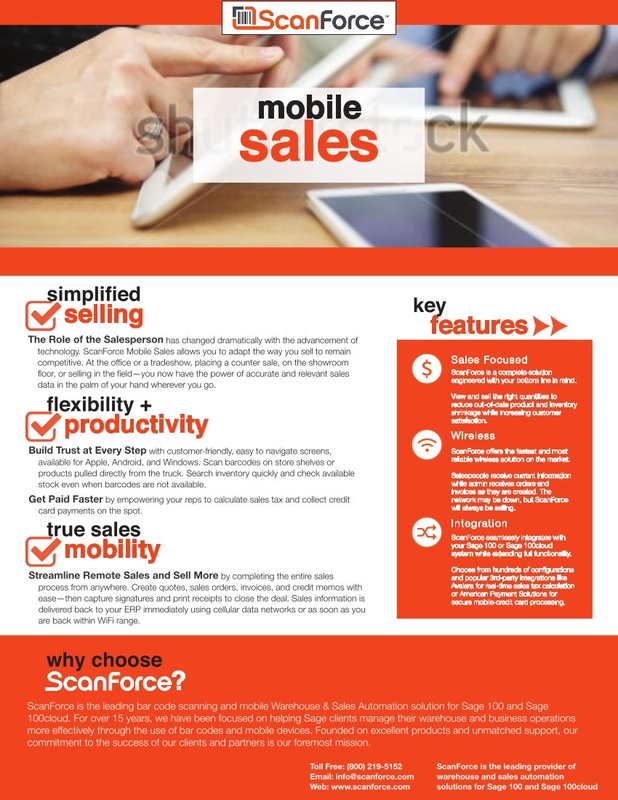 ScanForce provides a full suite of Warehouse Management solutions, as well as Mobile Sales for field reps.
Because ScanForce connects directly to your Sage 100 data, they’re able to offer the fastest item lookup technology on the market. Read about the ScanForce 1,000,000 Record Challenge. ScanForce is a powerful barcode scanning solution that allows you to automate warehouse management and cumbersome inventory-related tasks. 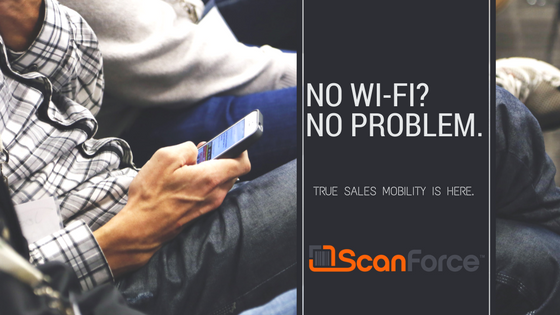 Whether you need to streamline workflow, track inventories, mobilize your sales team, or create labels, ScanForce gets the job done in no time. Tracking production in your Sage 100 system can be challenging. It is important to know inventory levels of not only the finished product, but also the components (or raw materials) used to make those finished products. ScanForce Manufacturing Automation alleviates these issues by allowing workers to use handheld scanners to record the finished product and indicate the quantity produced. Automating the production entry process streamlines the manufacturing process by allowing you to view inventory levels in real time, and giving you peace of mind in knowing that your Sage 100 data is up-to-date as well. In this day and age many products already come with a barcode label on them from the manufacturer. Scanning those barcodes is an integral component of automating your business processes. So what do you do if you are the manufacturer, or if the products do not have a barcode on them? The answer is simple -- ScanForce Label Printing. Whether you’re looking to print labels from your desk, or from your mobile device on the receiving floor, ScanForce Label Printing has all of the options you will need. With a completely flexible label design editor, and integration into Sage 100 for your printable data fields, ScanForce Label Printing can generate labels with all the information you need and want. 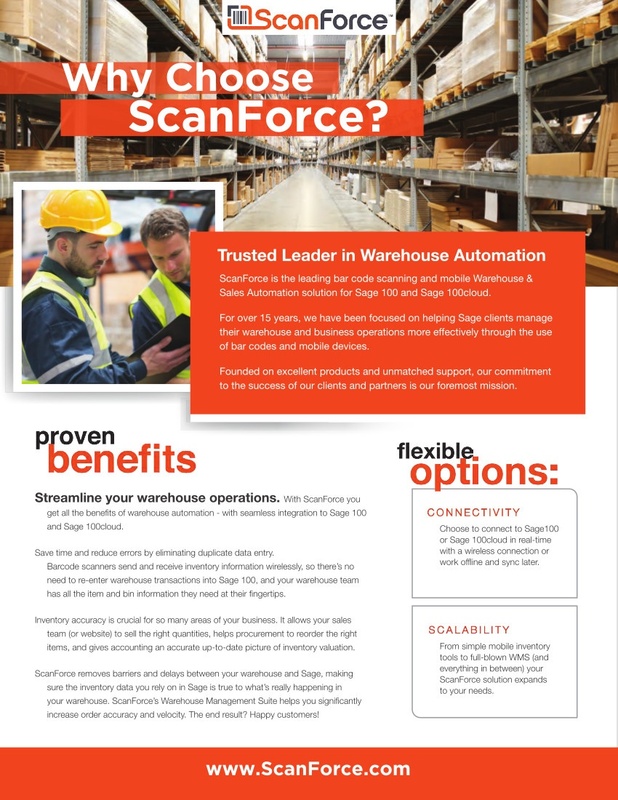 ScanForce saved us thousands of dollars when we integrated ScanForce’s software with our warehouse order fulfillment and systems…We couldn’t have met the demand for 15% increase in sales last year without ScanForce. We purchased the ScanForce barcoding software and equipment in May of 2012. It has been, in my opinion, the single best purchase our business has ever made to improve efficiency and accuracy with inventory in our business. Not only has it eliminated the errors that comes with manual entry, it has made our remotes sales people responsible for their own customer invoices and truck inventory. No more finger pointing! It is easy to use, and problems have been virtually non-existent.